Family Friendly Bathrooms, water fountain, playground and parking all at trailhead. The trail itself suits kids and beginners due to its overall low difficulty level. All obstacles can be bypassed or walked over. Please do not ride on trail when it is muddy. If you are picking up mud on your tires and/or leaving ruts in the trail, wait until conditions dry out. Not only does it harm the trail, it will also make your bike a muddy mess very quickly. 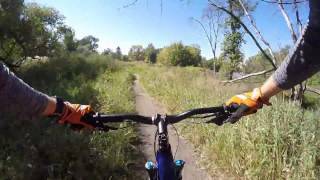 The Gooseberry Park Trail is a singletrack trail that winds through trees that surround Gooseberry Park in Moorhead, Minnesota. This trail is great for beginners and experienced riders alike. Beginners will gain confidence riding here because it is pretty flat, wide, and mostly tame. All obstacles can be ridden around or walked over if you decide not to ride them. Experienced riders will enjoy finding the flow at higher speeds as well as mastering all of the trail features. Since this trail is fairly short, multiple laps can be ridden at a time for a great cardio workout. The trail is fairly well marked and well maintained by the F-M Trail Builders. The trail was in great shape.